← Google Analytics – in Real Time! Over the years I’ve done my share of “big case” dentistry. And, I’m often asked how I get the “big cases.” Yet, I also understand many dentists have no interest in doing big cases. For today’s installment, I’m going to skip the rather broad topic of attracting “big case dentistry” and get to the actual presentation to the patient. Specifically, I’ll show you how I present it in written form. A large treatment plan, when spit out by your PMS is a laundry list of codes and fees that means little to nothing to a patient. Worse, it can be very intimidating and confusing. “What’s this ‘P-slash-C’ for, and why does it cost $295?” The patient will tend to look at long list of procedures (looks like a LOT of work!) and each individual fee. Then he or she will start to question each one… if not vocally, at least in his or her mind. What does all this mean to a patient? Does it answer all of the patient’s questions? A large treatment plan spit out by your PMS is impersonal and doesn’t answer patients’ questions about their treatment. Sure, you can explain it verbally to the patient face-to-face. But, when the patient goes home, the “significant other” may want an explanation. The patient, unable to relay all that information, will probably just hand over the PMS treatment plan printout. And, that’s not good! If you listen closely, you might even be able to hear the spouse yell out, “WTF!?! ?” all the way across town. You should know that what I will propose here involves more work. Yep… work! And a bit of time. But, it’s WELL WORTH IT. And, you’ll get better and faster at it as you gain more experience doing it. 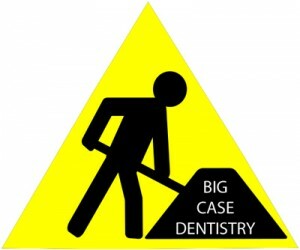 If you want to do “big case dentistry,” I believe this is critical. A good treatment plan presentation (verbal and written) is one that answers the patient’s questions. We dentists tend to focus on the how and why instead of the BENEFITS to the patient. Of course, we also have to cover alternative treatment options, risks vs. benefits, etc. We can do it in a patient-friendly way, though and still cover our bases. What is it good for? Aaaaaabsolutely nothin’… say it again! So, what do patients want to know? Do they want to know about osseointegration? Nope! Do they want to know how you’ll be bonding materials to their teeth? Nope! Do they want to hear about how a post and core is placed? Nope! Do they want to know about crown-root ratios? NO! Stop thinking like a dentist. Pretend, for a moment, that you are talking to a non-dentist… a regular person… your patient. That’s it!! Really! It is! Over the years, I developed a way to present treatment and answer those questions, while covering my “informed consent” bases. I quit printing out those PMS treatment plans. I quit itemizing the fees. It wasn’t working for the big cases. Not at all! I wanted to present treatment options, informed consent, and answer the patients’ questions in one fell swoop. Again… there’s no real automated / lazy way to do this. But, at the end you’ll see that after a while, you can make the process more efficient. I present the whole case and a single CASE FEE printed on paper created by a word processor. Remember the patient’s questions (see lists above). Let me back up a bit, though. If the case has a number of options (and they usually do), I’ll present those options first, in general terms, along with pros and cons and fee ranges. So, if you can imagine a case where the patient may have missing teeth and others in need of restoration. 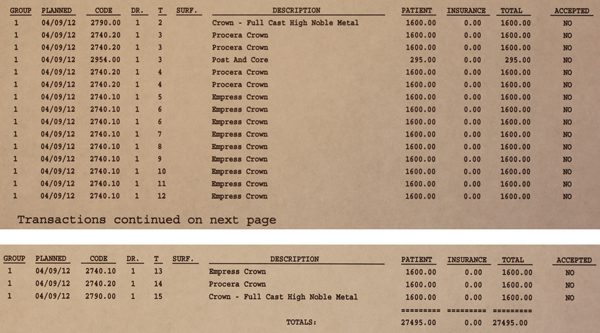 Options might include: removable, traditional crown & bridge, and implants. Three basic options. Start there. Or it could be a cosmetic case that could be an orthodontic + minimally invasive restorative vs. ten or more porcelain restorations. Also remember to include the option of no treatment (and possible consequences). Here is an example of the Treatment Options Overview. You can click on the image to download a .pdf version that you can see better and save on your computer for future reference. 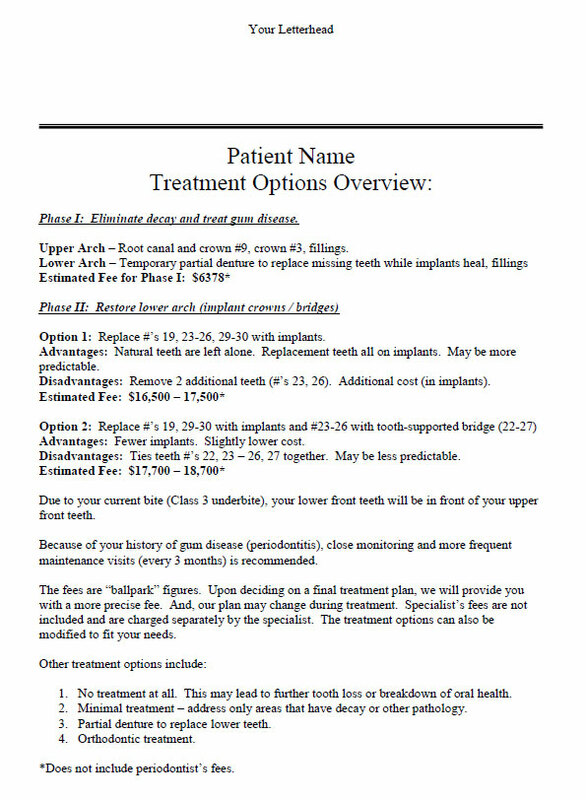 An example of a “Treatment Options Overview.” Click on the image to download a .pdf file that will be easier to see (and save on your computer for future reference). It helps to print it out in an easy-to-read-and-understand format. And, again, consider a significant other at home may be looking at it (and be involved in the final decision). Once the patient has decided on a particular option, I write up the treatment plan, again remembering the patient questions. I summarize the treatment. Then I map out the number of appointments (and time between appointments). And, I quote a CASE FEE. I don’t break it down by the tooth. It’s the whole case, soup to nuts. One fee. I also include any “informed consent” caveats that should be mentioned. Below is an example of a final treatment plan. Click on the image to get the .pdf version. Treatment plan includes general description of treatment, sequencing of appointments, and informed consent info. Click on image to download .pdf for better viewing and saving. The “heart” of the Treatment Plan is the schedule. Below is an example of an extensive treatment plan. This case took about a year to complete. Clicking on the image below will download the .pdf version. This is an extensive treatment plan. Click on image to download .pdf. This approach has worked very well for me over the years. In this economy, I’m not doing as many of the “big cases” as I was in years past. But, I expect once the economy turns around (whenever THAT’S going to be! ), there will be a pent-up demand for these services. The question is: Will you be ready to surf that wave when it comes? So, if you’re not already comfortable doing big cases (but would like to), sharpen that saw by going to as much related CE as you can. And, then when the right patient comes in, you’ll be ready not only to do the case, but effectively present it as well. Remember what the PATIENT wants to know. Keep it simple! Feel free to adopt and adapt my approach on a word processor to suit your own style. Once you’ve got a number of these stored on your hard drive, for any given case, you can go back and modify a previous similar plan (and not have to start over from scratch). So, it does get easier and more efficient. 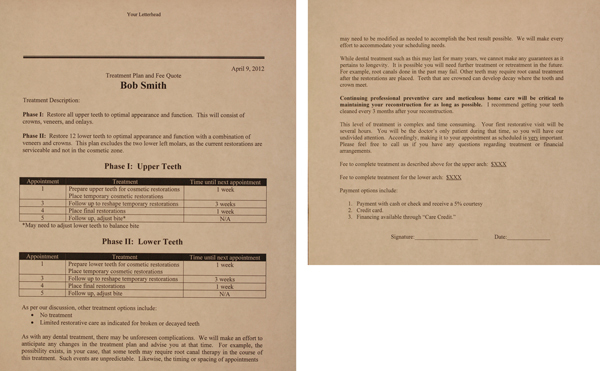 This entry was posted in Case Presentation, Editor's Favorites, Practice Management and tagged big case dentistry, case fee, informed consent, treatment plans. Bookmark the permalink. Thanks again, Mike. I’m going to pilfer your templates. I do a lot of full mouth cases and you are right: giving the patient too much info is a bad thing. Just let them know that you’ll take good care of them, that you stand behind your work, and that they’ll be able to chew and smile with confidence. Hey Mike, what’s “rocket surgery”? I too have noted less of these bigger cases in recent times. My question to you would be approximately how much time does it typically take for you to finalize the final treatment plan. Obviosuly some of that will depend on the patient but I am guessing you have a couple consultation appointments? One for the treatment options overview and then a 2nd consult for the final treatment plan? I realize you are probably at a point and time in your career where these big cases seek you out but I’d like to see you write sometime on how you approach people unaware of their dental problems who are big cases but don’t know they are (or at least won’t acknowledge they are). I’ve got bunches of these treatment plans “in the can” on my hard drive. So, most times, I can dig one up and just modify it. But, before that, I sit down with x-rays, models, photos, etc. and sketch out some options on a blank piece of paper. Sometimes we have 2 consultations (options and final). Other times, we can sort it all out at the options consult. Just depends. How do I approach folks that have big issues but don’t know? I just say, “Duuuuuuuude… your grill be all jacked-up!” 😉 Just kidding. Honestly, most of them know. They just don’t know what can be done because other dentists never tried to tell them. 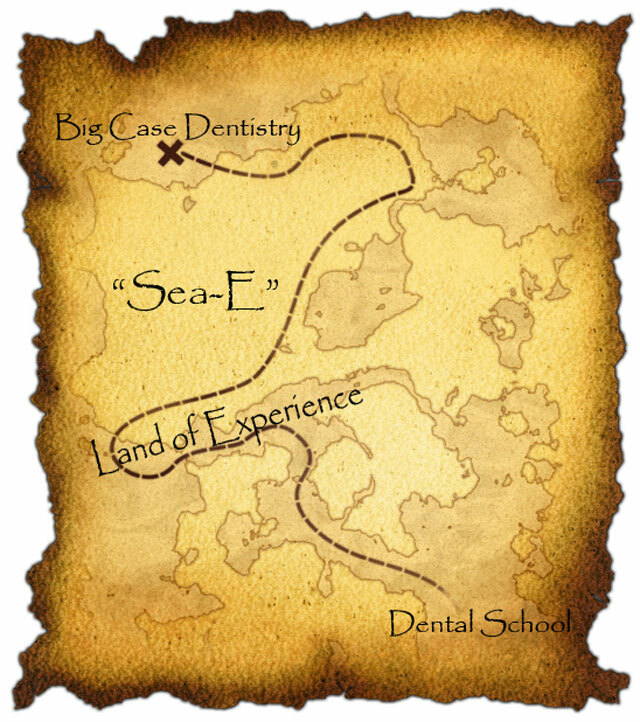 Most dentists don’t want to do big cases. Some are afraid if they present a big case, the patient might say YES! Some are afraid of rejection (of the big fees). “$30,000??? Are you out of your mind, Doc?? 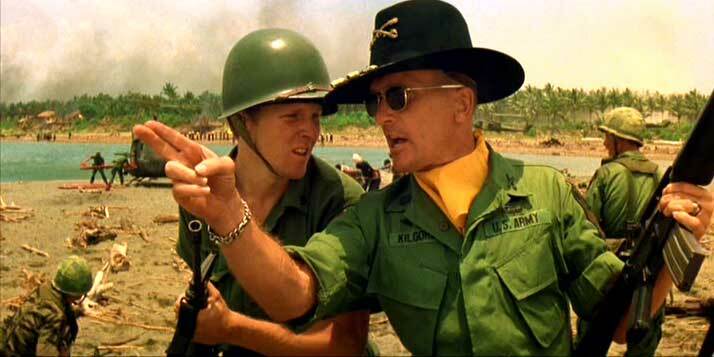 ?” Some dentists don’t like hearing that. So, they avoid the “confrontation.” Of course it’s nothing like a confrontation. But, most people don’t like rejection. So, it’s easier to never ask. Hi Vijay! Nice to hear from you. I’m just doing this in Microsoft’s “Word.” I create a table to organize the treatment sequencing. Over time, I’ve saved a bunch of these on my hard drive. So, if I can, I try to find a similar case and then just modify it for the next case. I’m still co-chairing Farokh Jiveh’s course at ACDRC. Hope to cross paths soon! Thank you so much Mike (and Google)! I was looking for one of your letters as an example of how to present a case, and I finally stumbled across this post. Great stuff as always! I have been devouring your blog posts for the past week or so. As a new grad, I am learning so much here! Thank you Mike. Thanks, Kelly! Congrats on graduating and best wishes! I try to put a treatment plan from hygiene first, chef complaint then worst condition teeth and last the most important teeth to save first to last ( such as 6 and 11 is important to save for partial denture) but my boss ( not a dentist) want me write down from tooth number 1 to 32 in that order. She said easier for the front desk to type the treatment plan. And i don’t agree with her. I feel that the big treatment plan the fee is too high, so if address the chef complaint first and get patient out of pain is very important, that will increase trust level between patient to doctor. And then take out the worst condition and save the one may have possiblity need RCT if wait then RCT may become necessary( that will increase extra 1000 dollars). I don’t think because it is easy for the front desk and scare patient off by fee. Let me know what you think? and your opinion of my boss thinking? Hi Bernard. Thanks for visiting my blog. Every case and every patient is different. I agree that treating the chief complaint first is the best way to gain the patient’s confidence. After that, it really depends. I try to get to know the patient and his or her goals. Then I tailor the treatment plan to fit that. I will also come up with multiple options, so that we can fit the patient’s financial resources. that is what i am trying to do. But the boss want me to write down from tooth #1 to tooth #32 in that order. I totally not agree with her. She said that is hard for the front to type the treatment plan. How you resolve that problem? How you can make the front desk easier to type the treatment plan? I don’t think I can answer the question, unfortunately. It depends on the systems in place at your practice. I recently converted to Open Dental software, and it is very, very easy to punch in the treatment plans (in any order). It also makes it easy to split the plan into groups and prioritize them. Presenting options pro and con is the ethical thing to do. However most do not tell patients the truth that conventional treatment may outlast implants which are often, to make the sale, touted as forever. Patients are rarely informed restorative is finite and will need replacement. Often cases eventually fail in senior citizens retired on fixed income who cannot afford replacement or even those younger now without resources to replace. Such contingencies are rarely if ever disclosed for fear of losing the sale. 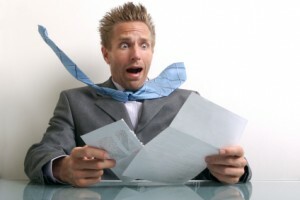 Currently, provider economic factors present as student loan payback, office overhead, discount plans and life style. How do we rationalize all these factors and discharge fiduciary responsibility to our patients who trust us. Will that trust which is our only “coin” vital to acceptance ultimately be squandered? Hi Lloyd. Thanks for your thoughtful comment. I have not found that patients pick “the cheapest way out.” Most patients want “the best.” Certainly, some cannot afford it. I try to present all options, and my patients vary across the board in which they choose. Some choose the best. Some choose the middle. Some choose the least expensive. ALL patients deserve to know their options, regardless of their perceived socio-economic status. I routinely tell patients about the potential and, if they live long enough, almost inevitable failure of restorative treatment. I don’t fear “losing the sale.” I think we are obligated to fully inform our patients. And, I don’t believe I’ve EVER lost a case due to the reality that they will need maintenance / replacement in the future. Thanks Mike. This article is very helpful and full of great ideas for treatment presentation. I am looking forward to trying this form of presentation with our big cases especially as I have also found that the “laundry list” prompts the patient to begin picking and choosing and you can see the overall confusion in their faces as they try to go through it tooth by tooth and procedure by procedure. Thank you again for the information and templates. Thanks for these examples and explaining the emotional influence of patient decisions. I’ve been working on my case presentation skill for extensive cases to keep it short & simple by answering What (summary of what pt need), Why (if they ask), How (if but rarely asked) and How much & how long to complete case. Then I came across your article…what a blessing!! I tend to “get in the weeds” and find myself going into the “why” first…(perhaps to ‘defend’ or ’empower pts w/ knowledge so they can make the best informed decision for themselves’). Your forms will help me to keep it short and simple. Thank you again so much for sharing this with your colleagues.